You almost half expect Paul and Richard to release their books featuring the exact same content with the names switched around and their photos on the cover. Of course all the MS stuff would be crossed out... maybe, who knows with those two. Anyway, assuming this is as close an account of Tim's actual life we're likely to get, it is a great read for anyone who is a fan of Tim's comedy and DAAS. As with most autobiographies Tim goes through his early family and school life which gives you some insight into the person he grew up to be. Along the way he highlights key moments that, in hind sight, were likely early signs of MS rather than over indulgence in a rock'n'roll life style of a successful comedy trio. It's particularly interesting to learn that despite Richard Fidler's onstage persona as a some-what naive innocent, behind the scenes he was actually the more organised and well read of the DAAS trio... and that Richard's stunningly attractive sister was a driving force for Paul and Tim in terms of trying to impress her with their comedy skills (to no avail). He also documents memorable moments in his career, both during DAAS and life after the group broke up, where he continued to work whilst still hiding his condition. Incredibly he even managed to get through a couple of live presentations experiencing symptoms of MS without anyone really noticing. Whilst the MS has caused his career to change direction it certainly doesn't seem to be slowing him down too much. The book describes how he transitioned into a successful comedy writing teaching career with a number of his students going on to find comedy writing success. He's also written one of the few manuals on narrative comedy writing called The Cheeky Monkey. As I said at the start of this review, Tim is back out touring with DAAS in 2015. If you get a chance to see him live it'll be one of the best comedy shows you'll ever see where everything is fair game - even the guy in the wheel chair. 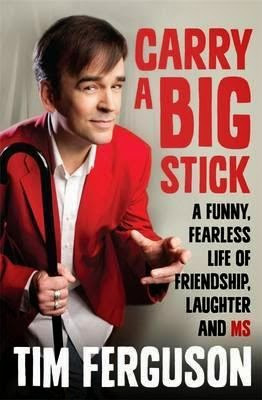 Carry a Big Stick is a fascinating glimpse into the life of someone many Australians grew up with on the TV comedy show, The Big Gig, who then went on to being a familiar face on Aussie TV beyond the success of DAAS. I wouldn't say this book is laugh out loud funny, though it does contain funny anecdotes. It comes across quite often as more of an explanation behind the jokes and for Tim's motivation to be a success at comedy. It's inspiring not because of Tim having to overcome MS but because he's continued to be successful despite the MS.